Big news today, as Sony announces a whole slew of cameras. Let us start with the more traditional (but not quite) DSLRs, the translucent mirrored SLT-A77 and SLT-A65. The SLT-A77 features a 24 megapixel APS-C-sized CMOS sensor with sensor shift stabilisation, a new XGA resolution EVF with 100% coverage and 1.09x magnification (which is 0.72x if you want to compare with other 35mm cameras), 1/250 flash sync speed, 19 point AF system with 11 cross sensors, a weather-sealed magnesium body, standard ISO range of 100-16,000, continuous shooting at 12 (!) FPS (making it faster than the D3 or EOS 1D IV), a 3" VGA sensor on a new rotating platform (which flips down, not my favourite implementation), built-in GPS, and a bunch of shooting modes. Oh, on the video side, it does 1080p videos at 60 FPS, allows for manual controls, and has an external microphone jack. The camera comes with a Memory Stick (bleagh) and a SDXC slot. Ships in October for US$1,400 for the body alone, or US$2,000 with the new 16-50mm lens (detailed below). 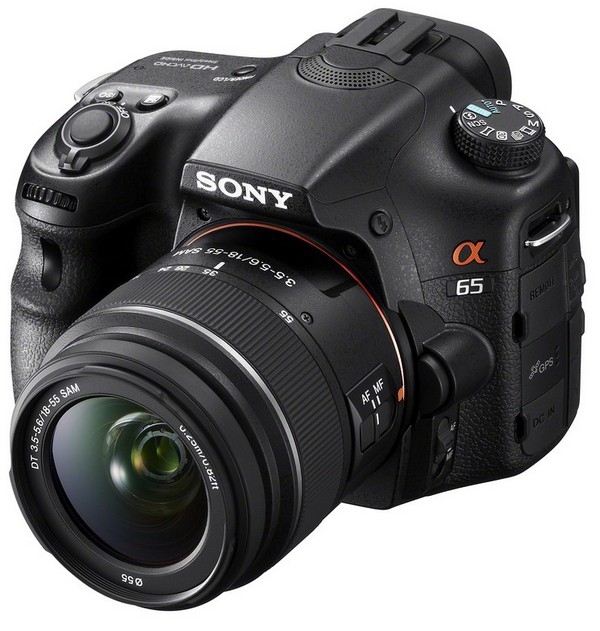 The SLT-A65 is similar (yes 24 megapixel sensor), and drops a few features, notable, the AF module is a 15 point system with 3 (talk about a drastic drop) cross sensors, continuous shooting is down to 10 FPS (still faster than many cameras), drops flash sync speed to 1/160, loses the top LCD panel, and overall is less robust in build than the SLT-A77, with a full plastic body and lower rated shutter count. Ships in October for US$900 for the body alone, or US$1,000 with the 18-55 lens. Photo of the SLT-A65 after the break, and there are more links at the source. 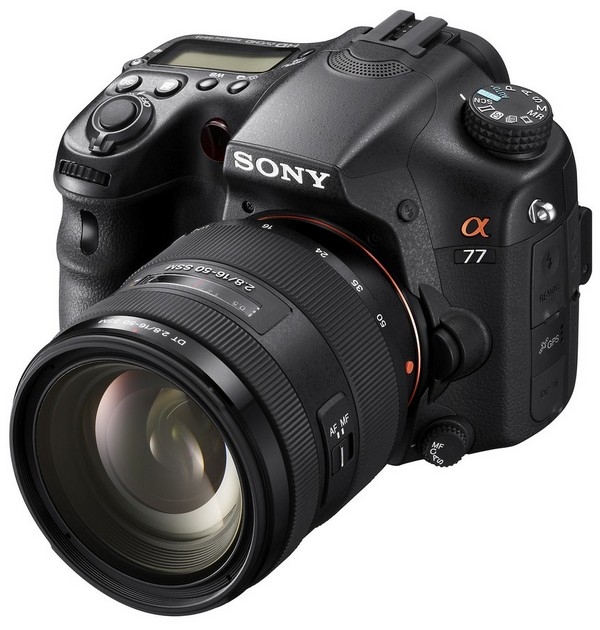 Also, DPreview.com has a preview of the SLT-A77.